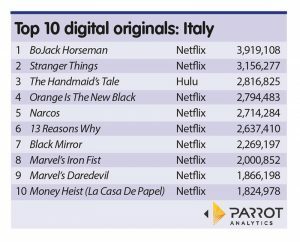 BoJack Horseman was the most in-demand digital original in Italy for the week ending September 23 in a list made up almost exclusively of Netflix titles, according to Parrot Analytics’ latest statistics. Parrot Analytics analyses the demand for recent popular digital titles across international markets, based on the application of artificial intelligence to expressions of demand across social media, fan sites, peer-to-peer protocols and file-sharing platforms. 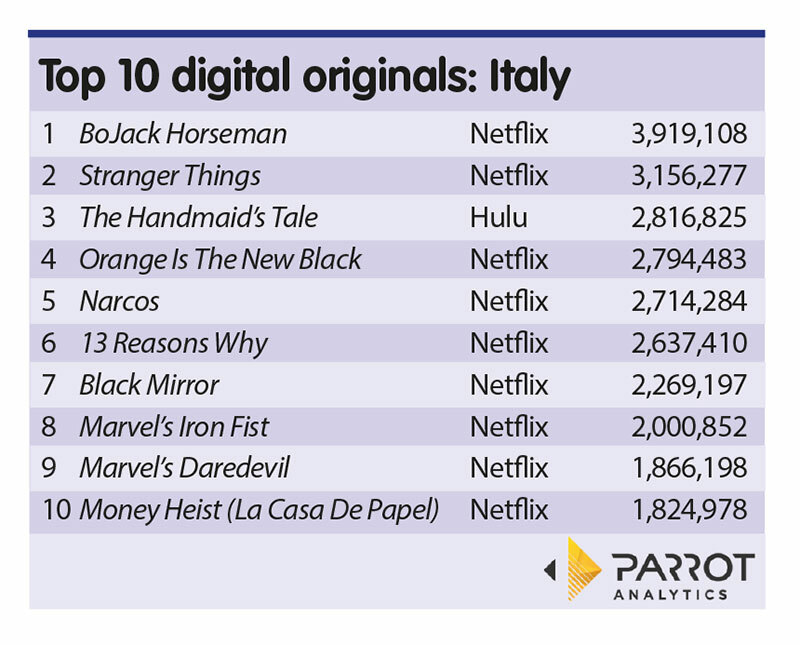 Parrot’s list of the top 10 digital originals in the Italian market for the week from September 17-23 was dominated by Netflix, with BoJack Horseman leading the way with 3.9 million demand expressions. Netflix’s Stranger Things placed second with 3.2 million demand expressions while Hulu original The Handmaid’s Tale – the only non-Netflix title to feature in the top ten – came in third with 2.8 million demand expressions. Prison comedy-drama Orange Is The New Black and Colombia-set drug-trafficking drama Narcos were the fourth and fifth most popular digital originals in Italy with 2.8 million and 2.7 million demand expressions respectively. The rest of the top ten was made up by Netflix’s 13 Reasons Why, Black Mirror, Marvel’s Iron Fist, Marvel’s Daredevil, and Spanish drama Money Heist (La Casa De Papel).